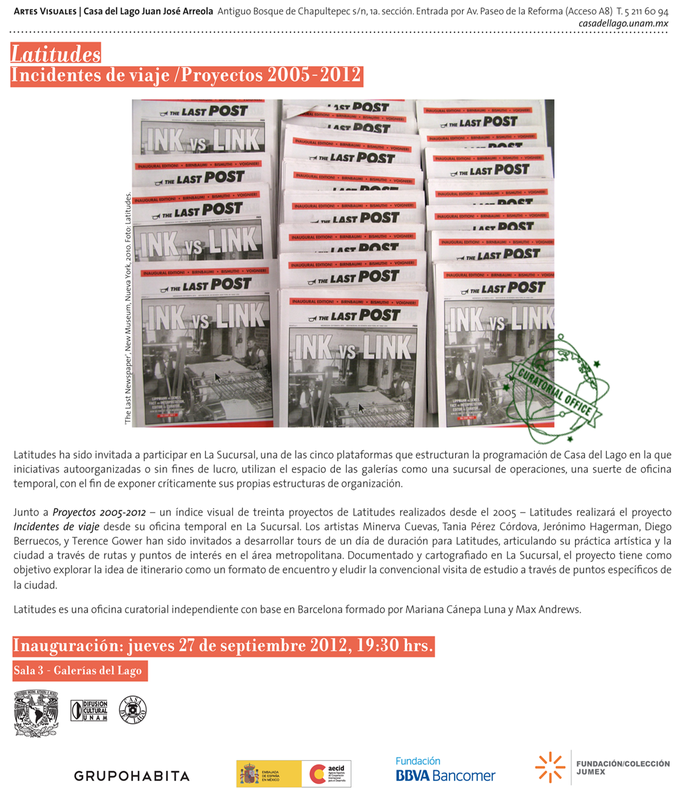 Alongside 'Projects 2005–2012' – a visual index of the thirty projects of Latitudes realized since 2005 – Latitudes has originated 'Incidents of Travel' from its temporary office in Casa del Lago's La Sucursal. Artists Minerva Cuevas, Tania Pérez Córdova, Jerónimo Hagerman, Diego Berruecos, and Terence Gower have been invited to develop day-long tours for Latitudes, articulating the city and their artistic practice through routes and waypoints in the metropolitan area. Documented and mapped in La Sucursal, the project aims to explore the chartered itinerary as a format of artistic encounter with the capacity to bypass the convention of the studio visit through highly specific views of the city. 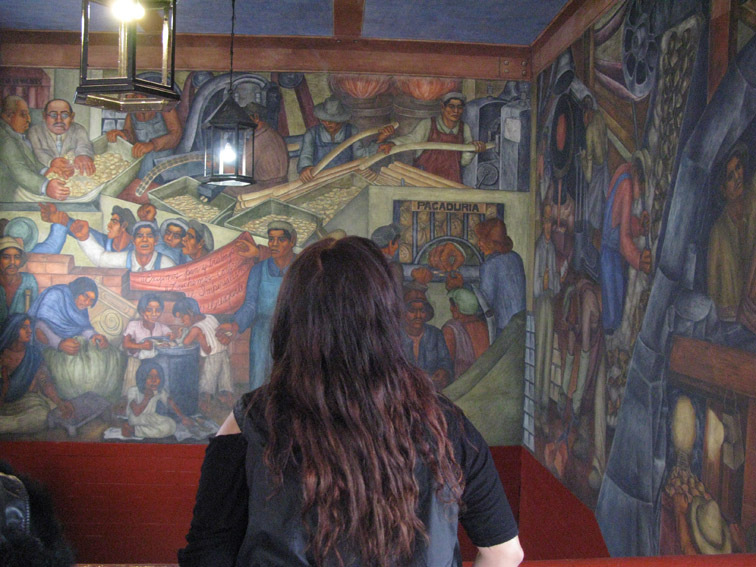 Minerva observing the murals by Marion Greenwood at the Mercado Abelardo L. Rodríguez. 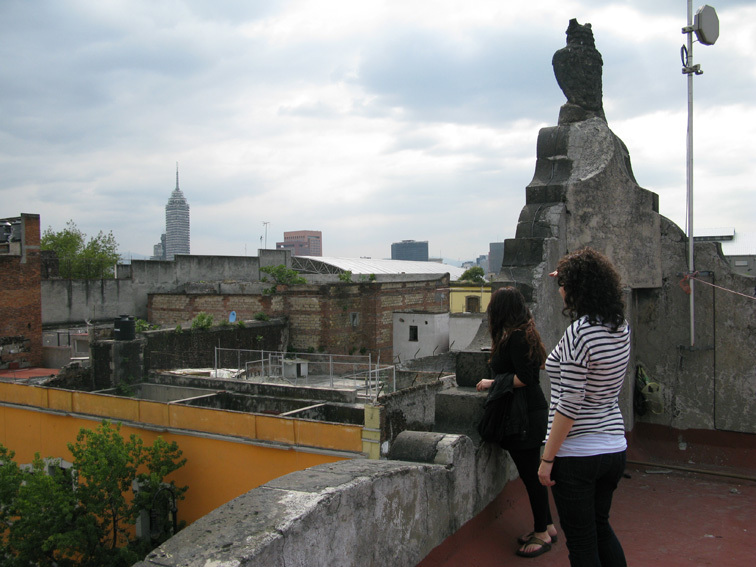 View from Minerva's studio roof (Torre Latinoamericana on the horizon). 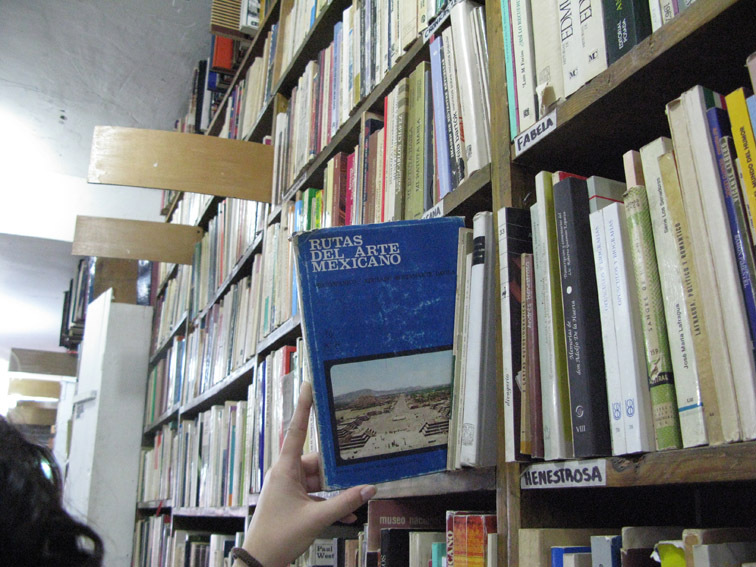 Browsing the 'Mexican Art Section' at a bookstore on Calle Donceles. The route proposed by Minerva Cuevas focused on the concept of the public and its socio-economic associations. 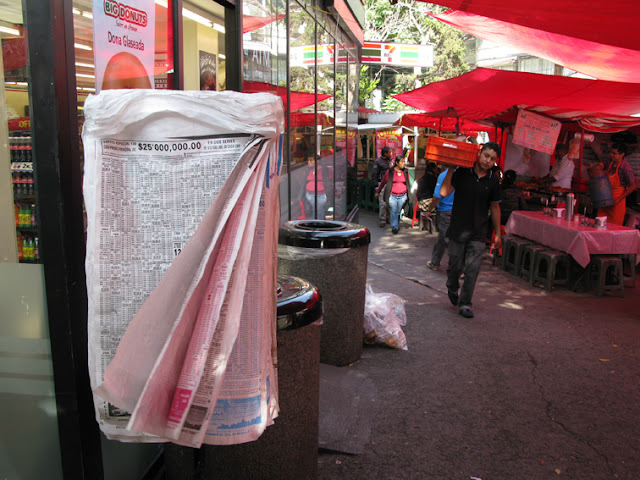 The tour began in the Plaza de las Tres Culturas in Tlatelolco, continued to the Tepito and Lagunilla neighbourhoods, and from there visited nearby markets, public squares in the historic centre of Mexico City. It concluded with a visit to the Torre Latinoamericana, a symbol of modernity of the city in the 1950s. Throughout the course of the journey, rural elements that constitutes an integral part of the city are highlighted. 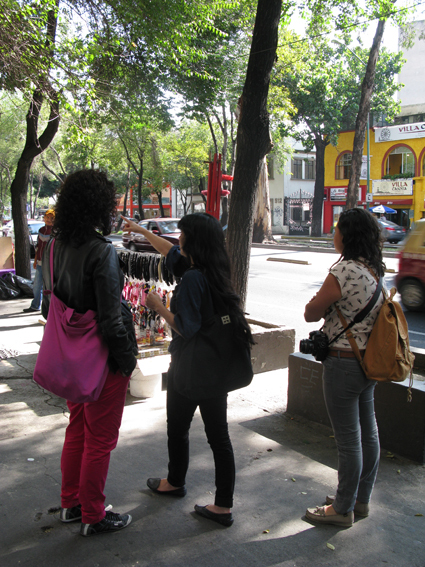 Exploring Insurgentes with Tania Pérez Córdova and photographer Eunice Adorno. View of nearly collapsing 19 floor "Canadá" building on Av. Insurgentes. 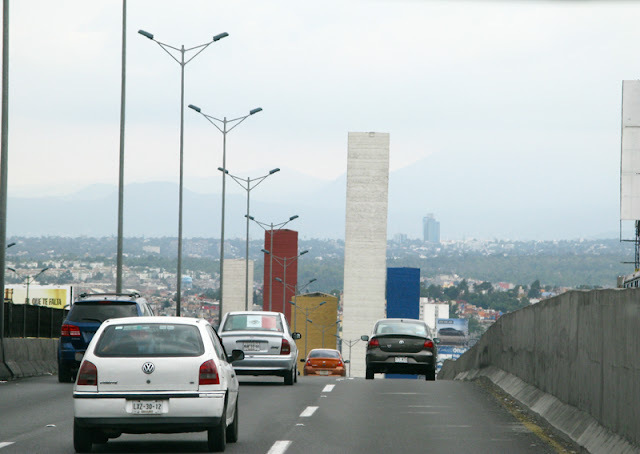 The tour proposed by Tania Pérez Córdova traced the route of a stretch of Avenida de los Insurgentes – the longest avenue of Mexico City which extends from the Mexico-Pachuca to the Mexico-Cuernavaca highways. The tour focused on certain points up and down this thoroughfare, becoming a mental journey with the daily commute of the artist as its starting point. Av. Universidad 1601. 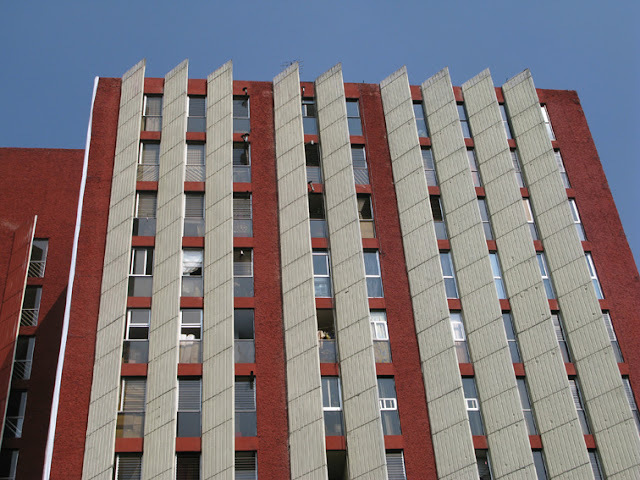 When Miguel de la Madrid left the Mexican Presidency in 1988, this apartment block was fitted with angled concrete blinds in order to block residents' views of his garden and house across the road. 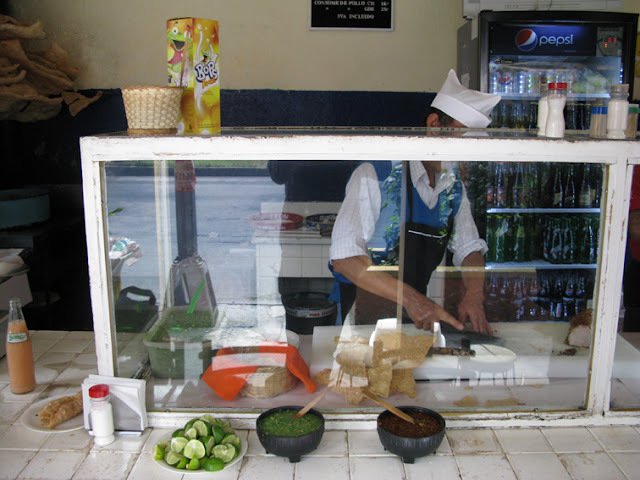 Tacos of maciza (like pulled pork) and chicharrón (fried pork rind) made by Don Tomás at El Venadito, Avenida Universidad near the corner of Miguel Angel de Quevedo. 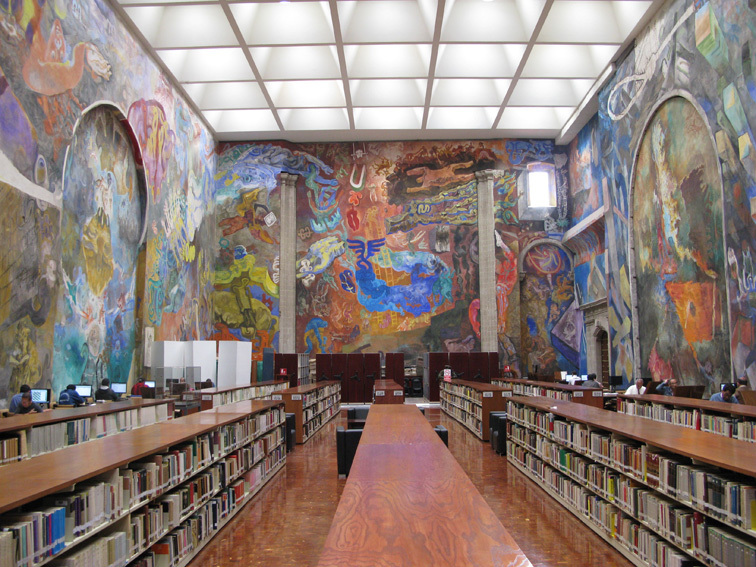 Murals and canvases on "Freud, the revolution and its elements" by Vlady at the Biblioteca Nacional Lerdo de Tejada. The library gathers the archive of the Secretaria de Hacienda y Crédito Público. Its collection is one of the most important archives in Latin America dating from the 18th Century onwards and focusing on economics. Diego Berruecos's tour encompassed several points in the city where he found the raw material for his ongoing investigation PRI: Genealogy of a Party. The itinerary takes in the Hemeroteca of the UNAM, where he photocopied obituaries relating to the 2007 sudden death Monica Pretelini, wife of the then governor of the State of Mexico, Enrique Peña Nieto. From there, brunch was enjoyed at El Venadito, which, according to the artist, "serves the best carnitas tacos in the city". This is a regular spot for the artist and is next to a major building in his research, which inspired one of the most interesting branches of his artistic genealogy: the series 'Architecture of Power'. This building is located in front of the home of the recently deceased Miguel de la Madrid Hurtado, 52nd president of Mexico. Finally, a visit to the Biblioteca Miguel Lerdo de Tejada and the Library of Congress, and end at El Sella restaurant "which serves the best chamorro in the city". 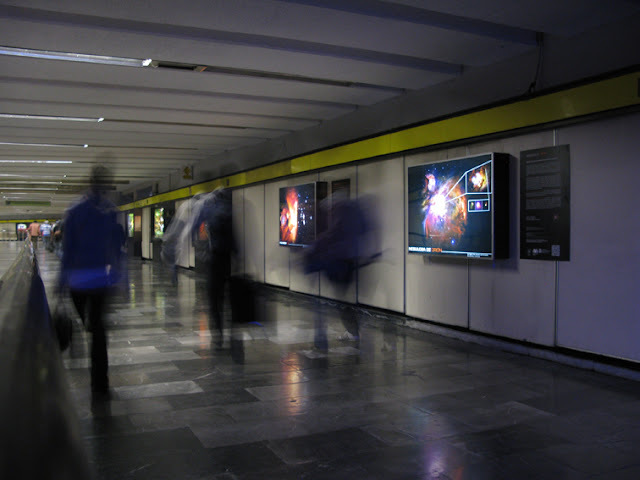 Estación de metro La Raza - Túnel de las ciencias: a metro transfer turned into an educational experience. 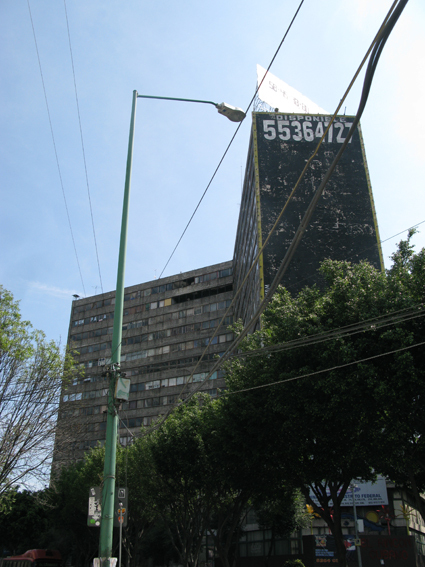 Unidad Habitacional el Rosario: a 1972 condominium with its characteristic cube-shapped 'zotehuelas' (windowless cantilevered kitchen patios). Torres de Satélite - a 1958 collaboration between architect Luis Barragán and sculptor Mathias Goeritz in Ciudad Satélite, northern part of Naucalpan, Mexico City. Terence Gower's tour, 'Urban Models (Zacatenco to Tlalnepantla)' looked at universalist urbanism models in the northern sectors of Mexico City. The tour started at the 1963 campus of the Instituto Politécnico Nacional, an expression of order and building technology that perhaps hadn't quite arrived in Mexico at the time of its construction. 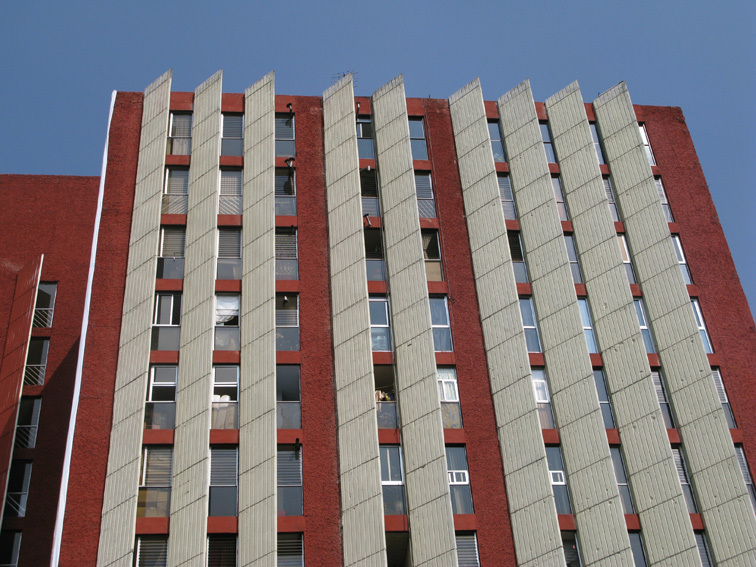 The tour next visited two housing complexes: Unidad Habitacional El Rosario was from the post-war building boom that produced complexes like Tlatelolco, employing the urbanistic principals of density and land-use of Le Corbusier and the Athens Charter. 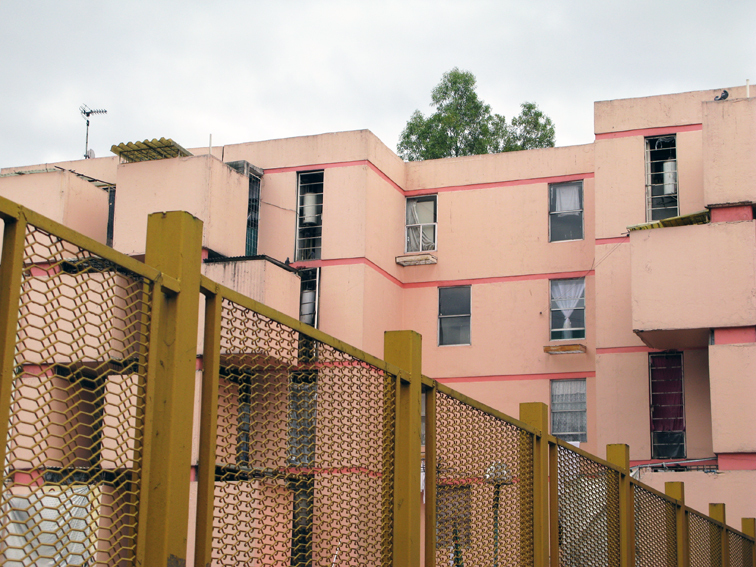 The second, the Unidad Habitacional de San Buenaventura, is a recent "cookie-cutter" style private development in which identical houses are built in rows that blanket the landscape. Similar to the Politécnico scheme, these recent developments are attempts at imposing order on the chaos of Mexico City. Finally the tour visits Satélite, a low-density suburban-US style development that has generated its own unique culture. Lunch was at Solo Veracruz es Bello, and concluded with a visit to Metro La Raza. "Copa de oro" and ivy in Casa Barragán, México. Colourful trajineras in Xochimilco take tourists and city residents alongside the 170km canals and chinampas (artificial islands, a vestige of Xochimilco's pre-Hispanic past). Black lava flow, lush greenery, concrete and red crushed tezontle at the incredible Espacio Escultórico at the UNAM. A 1978-1980 collaborative work by Federico Silva, Mathias Goeritz, Helen Escobedo, Manuel Felguérez, Hersúa y Sebastián. Jerónimo Hagerman's visit delved into some situations, phenomena or cases in which he finds a particular, intense and emotional relationship between Mexico City, its inhabitants, with the outdoors, the wilderness and the nonhuman nature. The tour visited public and private spaces of different kinds, starting with the house-studio of architect Luis Barragán, followed by a tree invaded by ivy in colonia Polanco, the Espacio Escultórico of the UNAM, and a food tour around the chinampas (artificial islands) in Xochimilco. The day ended with a drink at Bellini, the WTC revolving restaurant which offers panoramic views of the city and a night visit to the Mercado de Jamaica.